Sign-up now to receive a registration packet for the Clothesline Art Sale. 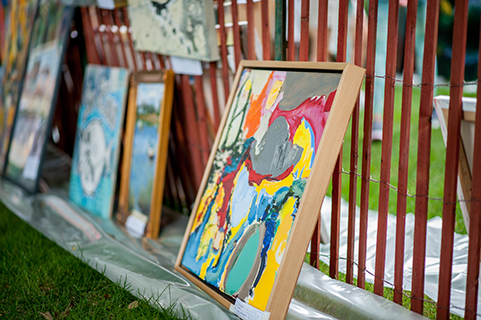 Since 1946, Guild Hall has proudly hosted the annual Clothesline Art Sale which is a community event that showcases original works by East End artists. Nearly 400 artists enter the sale each year. The sale attracts thousands of art lovers who are looking for the next de Kooning, Prince, or Sherman. Works range in price from $75 to $2,200, with all proceeds split 50/50 between the artist and Guild Hall. Proceeds from the sale help support our year-round programming. Sign up to receive a registration packet by mail.